Financial markets have become increasingly global in recent decades, yet the pricing of internationally traded assets continues to depend strongly upon local risk factors, leading to several observations that are difficult to explain with standard frameworks. Equity returns depend upon both domestic and global risk factors. Further, local investors tend to overweight their asset portfolios in local equity. The stock prices of firms that begin to trade across borders increase in response to this information. Foreign exchange markets also display anomalous relationships. The forward rate predicts the wrong sign of future movements in the exchange rate, implying that traders can make profits by borrowing at lower interest rate currencies and investing in higher interest rate currencies. Furthermore, the sign of the foreign exchange premium changes over time, a fact difficult to reconcile with consumption variability. 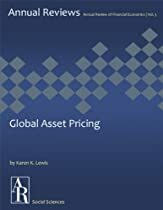 In this review, I describe the implications of the current body of research for addressing these and other global asset pricing challenges.